Herbert Marcuse (July 19, 1898 – July 29, 1979) was a German-American neo-Marxist philosopher and sociologist and a member of the Frankfurt School. His radical theories and critique of capitalism earned him popularity among leftists and notoriety among conservatives during the 1960s and 1970s. Although his influence on the American radical student movement has sometimes been overstated, his philosophy contributed to the extreme anti-capitalist and anti-establishment sentiments of the Counterculture era. Herbert Marcuse was born in Berlin in 1898 to a Jewish family. He served in the German Army during the First World War, caring for horses in Berlin. Immediately following the war, he was a member of a soldiers' council that participated in the failed Spartacist uprising of January 1919. After the war, he attended the University of Freiburg, where he studied Marxism and joined the Social Democratic Party, but avoided associating with the Communist movement. He completed his Ph.D. thesis in 1922, written on German literature, and he moved back to Berlin, where he worked in publishing. He returned to Freiburg in 1929 and studied philosophy under Martin Heidegger. In addition to his Marxist leanings, he was greatly influenced by the existentialism of Heidegger. In order to qualify to become a professor in Germany, Marcuse wrote a habilitation entitled Hegel's Ontology and Theory of Historicity. Although it was published in 1932, Heidegger rejected the completed manuscript, and Marcuse's academic career was blocked. In 1933, Marcuse was invited to join the Institute for Social Research, founded by the group of neo-Marxist philosophers known as the Frankfurt School. Soon after, when Adolf Hitler rose to power, he left Germany, following the members of the institute to Geneva and Paris before finally settling in New York, where he worked at the institute's Columbia University office. He became a naturalized American citizen in 1940 and remained in the United States for the rest of his life. In 1940, he published his first English work, Reason and Revolution, a dialectical work studying Hegel and Marx. During World War II, Marcuse worked for the U.S. Office of War Information (OWI) on anti-Nazi propaganda projects. In 1943, he transferred to the Office of Strategic Services (OSS) (a predecessor to the Central Intelligence Agency), where he did research on Nazi Germany and denazification. 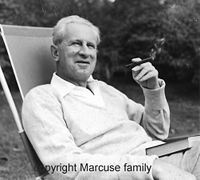 After the dissolution of the OSS in 1945, Marcuse was employed by the United States Department of State as head of the Central European section, retiring after the death of his first wife in 1951. In 1952, Marcuse began a teaching career as a political theorist, teaching briefly at Columbia University and Harvard University and then at Brandeis University from 1958 to 1965, where he was a professor of philosophy and political science. During this time, he published his two most important works, Eros and Civilization (1955) and One-Dimensional Man (1964). His last position, teaching at the University of California at San Diego from 1965 to 1970, gained him notoriety as the intellectual head of the nationwide radical student movement. He was a friend and collaborator of the historical sociologist Barrington Moore, Jr. and of the political philosopher Robert Paul Wolff. Marcuse's critiques of capitalist society resonated with the concerns of the leftist student movement in the 1960s. Because of his willingness to speak at student protests, Marcuse soon became known as "the father of the New Left," a term he disliked and rejected. His work heavily influenced intellectual discourse on popular culture and scholarly popular culture studies. He had many speaking engagements in the United States and Europe in the late 1960s and in the 1970s. He died on July 29, 1979 after suffering a stroke during a visit to Germany, where he was invited to give a speech. Marcuse was a philosopher in the critical theory tradition of the Frankfurt School and is known for his astute critique of post-war capitalist society. Although the Frankfurt School thinkers considered themselves dissidents of Marxism, they developed their critical views of society based upon the same atheistic and materialistic assumptions as Karl Marx and other Communist thinkers. Like most of the Frankfurt school, Marcuse was greatly influenced by Georg Lukacs's theory of reification in his book History and Class Consciousness. Like Lukacs, Marcuse believed that the citizens of capitalist democracies were unwittingly enslaved and dehumanized by the economic and political system. In One-Dimensional Man, Marcuse describes these capitalist societies as "totally administered societies" whose economic affluence has not helped, but victimized, its participants (the working class) by generating a variety of "false needs" that need to continuously be satisfied by the very system which created them. In such an environment the working class remains ignorant of the nature of the system which controls them, and is unable to carry out its revolutionary role as prescribed by Karl Marx. Marcuse and other members of the Frankfurt School saw it as the role of Critical Theory to criticize and debunk these harmful societies. However, Marcuse had a more optimistic outlook than other Frankfurt School thinkers like Max Horkheimer and Theodor Adorno, who together wrote the Critical Theory treatise Dialectic of Enlightenment (1947). Marcuse hoped that, despite the existing capitalist system, "the outcasts and the outsiders," who were not enslaved by the society, would initiate a social revolution to overthrow capitalism. In Eros and Civilization, Marcuse combines the ideas of Marx and Sigmund Freud to describe a peaceful society free from suffering and capitalist oppression. He sees the instinctual repression of sensuality described by Freud, not as a product of nature, but as a means used by capitalists to dominate the masses. Marcuse thus envisions a world in which, through the overturning of capitalism, people are allowed to exist in a state of natural freedom and self-gratification. In such a world, even work itself becomes a source of pleasure. He saw hope for the emergence of this "harmony of sensuousness and reason" in the beauty of modern art and the Counterculture of the 1960s, and he encouraged the radical student movement as a catalyst of revolution. In so far as Existentialism is a philosophical doctrine, it remains an idealistic doctrine: it hypothesizes specific historical conditions of human existence into ontological and metaphysical characteristics. Existentialism thus becomes part of the very ideology which it attacks, and its radicalism is illusory (Marcuse 1972). Marcuse was the most explicitly political and left-wing member of the Frankfurt School in the post-war period, continuing to identify himself as a Marxist, a socialist, and a Hegelian, while Adorno and Horkheimer became increasingly conservative in their old age. He is also known for his infamous 1965 essay, "Repressive Tolerance," in which he argues that genuine tolerance does not tolerate the repression of the left-wing agenda which he perceives as the objective of many people on the Right. Marcuse wanted to silence those who tried to preserve the status quo by ensuring that the more radical, marginalized voices would remain unheard, and he characterized tolerance of such repressive speech as "inauthentic." In other words, Marcuse condoned the repression of the more conservative voices in academia and the media for the sake of allowing more left-wing views to be heard. These radical views, which he often voiced at student rallies and protests, made him an extremely popular figure on college campuses. Marcuse's influence on the student movement has sometimes been exaggerated, and he was often no more than a figurehead whose work few people had read. He did, however, have a notable influence on certain leading figures of the radical movement, including the Black Power activist Angela Davis and the anarchist author Abbie Hoffman. Both were his students at Brandeis who admired his philosophy, and Davis eventually followed him to San Diego in the 1960s. The most outspoken critics of Marcuse's works have been conservatives who oppose the atheistic materialism of "Western Marxism," which was widely popular among students during the 1960s and 1970s. However, Marcuse's essay, "Repressive Tolerance," has received the sharpest criticism from the right. Many conservative critics, such as David Horowitz, lament the seemingly unjust policies of intolerance toward the right-wing agenda, especially on college campuses, and point to Marcuse's essay as one of the origins of this double standard. Breines, Paul Critical Interruptions; New Left Perspectives on Herbert Marcuse. [New York]: Herder and Herder, 1970. Callinicos, Alex, Marcuse, Herbert In E. Craig (Ed. ), Routledge Encyclopedia of Philosophy. London: Routledge, 1998. -------- Eros and Civilization; A Philosophical Inquiry into Freud. Boston: Beacon Press, 1966. -------- One-Dimensional Man; Studies in the Ideology of Advanced Industrial Society. Boston: Beacon Press, 1964. -------- Reason and Revolution; Hegel and the Rise of Social Theory. Boston: Beacon Press, 1960. Critical Theory by James Bohman, Stanford Encyclopedia of Philosophy. This page was last modified on 20 December 2017, at 15:13.